John Tyler's presidency was born in a fog of constitutional confusion. On April 4, 1841, President William Henry Harrison died of pneumonia, just one month into his term as the nation's ninth chief executive. It was the first time a president had died in office, and no one could say with certainty what was supposed to happen next. The relevant language in the Constitution was murky: "In case of the [president's] death, resignation, or inability to discharge the powers and duties of the said office," commands Article II, Section 1, "the same shall devolve on the vice president." But the antecedent of "the same" is ambiguous. Was the vice president to inherit the office, thereby becoming the new president of the United States? Or was he to assume only the executive powers and duties, serving temporarily as acting president until a new one could be chosen? In 2016, such a controversy would doubtless churn for months, playing itself out in dueling op-ed pieces and partisan talking points, until the inevitable lawsuit made its way to the Supreme Court. Just think of the debate ignited in recent months by Donald Trump, with his claim that Ted Cruz, who was born in Canada to an American mother, is not a "natural-born citizen" for purposes of presidential eligibility. "Let the courts decide," Trump has said. In 1841, by contrast, the issue was settled politically, and at once. Within hours of returning to Washington upon learning of Harrison's death, Tyler convened a meeting of the cabinet  all Harrison appointees, of course  and declared that he was now the legitimate president and not merely a caretaker. Tyler was a quiet man, and in the past had opposed Andrew Jackson's forceful expansion of presidential authority. That led some to assume that Tyler would do as he was told, allowing himself to be instructed by influential Whig Party leaders such as Senator Henry Clay and Secretary of State Daniel Webster. Cabinet members, Webster informed Tyler, expected to be treated as the president's partners in making policy, with decisions to be reached by consensus. "I beg your pardon, gentlemen," he said. "I am very glad to have in my cabinet such able statesmen as you . . . and I shall be pleased to avail myself of your counsel and advice. But I can never consent to being dictated to. I am the president and I shall be responsible for my administration." He told them that they must choose between giving him their cooperation  or their resignations. No one resigned. Instead, at Webster's suggestion, a federal judge was called to administer the oath of office, confirming Tyler's status as the new president. On his first day in office, Tyler had established a precedent that settled the question of succession without plunging the nation into a crisis of leadership. It was a precedent that Americans would follow ever after, and eventually formalize with the ratification of the 25th Amendment. Tyler and his administration are largely forgotten today. Historians have generally ranked him with the less successful presidents. Harry Truman  another accidental president who came to office upon the death of his predecessor  went so far as to call Tyler "one of the presidents we could have done without." In truth, however, the 10th president was courageous and principled, if not always wise, and he was beset by challenges and partisan conflicts that would be inconceivable for any modern president. Tyler was a Virginian, born to wealth and political connections. He had been raised to revere Thomas Jefferson, and when he went into politics it was as a Jeffersonian Democrat  a staunch advocate of agrarian republicanism, limited government, and states' rights. He served in Virginia's legislature, as the state's governor, and in the US House of Representatives. In 1827, he was sent to the US Senate, where he increasingly found himself opposing the policies of President Andrew Jackson. A fellow Democrat but no Jeffersonian, Jackson pushed federal and presidential prerogatives well beyond limits that Tyler thought tolerable. When South Carolina asserted that any state had the right to "nullify" federal statutes it deemed unconstitutional, Jackson proclaimed the right of the federal government to use force to compel obedience with the law. Tyler was appalled. Though he personally opposed nullification, he nonetheless voted against Jackson's bill to authorize military action  the only senator to do so. Tyler's disagreements with his party worsened. When Jackson unilaterally moved to dissolve the quasi-public Bank of the United States by transferring its federal funds to state depositories, Tyler voted twice to censure him. Once again Tyler acted not because he supported the bank  he didn't  but because he was outraged by Jackson's disregard of constitutional limits. In 1836, Tyler broke with the Democrats, and joined Clay's new Whig Party. 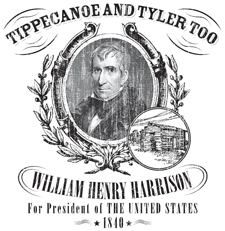 Four years later, the Whigs nominated him for vice president, choosing a Southerner to balance the ticket with Harrison, an Ohio general who 30 years earlier had led American militiamen in the Battle of Tippecanoe  hence the campaign slogan and song "Tippecanoe and Tyler too!" The campaign of 1840 was remarkably shallow. It was filled with "rallies, parades, and general malarkey," in the words of historian Gary May, but there was little serious discussion of public affairs. Though Harrison, at 67, was the oldest man ever to run for president, no one seems to have been troubled by the possibility that he might die in office, or to give much thought to the views of his running mate. At the Whigs' nominating convention, Tyler later said, "I was . . . wholly unquestioned about my opinions." That was a failure of due diligence that Clay and his Whigs would come to regret. Tyler had been expected to support Whig priorities, and high on the party's agenda was the reestablishment of a national bank. But when Congress passed a law resurrecting the Bank of the United States, Tyler  adhering to his longstanding view that the bank was unconstitutional  vetoed it. Congress passed another version of the same law; Tyler vetoed that one, too. What happened next was unheard-of. Whig leaders gathered and issued a statement expelling Tyler from their party, and every member of the cabinet (except Webster, who was then enmeshed in foreign negotiations) resigned. A mob of Whig supporters rioted outside the White House, throwing rocks at the building, firing guns in the air, and burning Tyler in effigy. The Whig press went ballistic. "If a G0D-directed thunderbolt were to strike and annihilate the traitor," editorialized one Kentucky newspaper, "all would say that 'Heaven is just.'" For the rest of his term, nearly three-and-a-half years, Tyler was a president without a party. In 1843, a House committee for the first time in US history recommended that the president be impeached (the resolution was defeated on the House floor). In 1844 Tyler became the first incumbent president to announce that he would not seek a second term. On his last full day in office, Tyler became the first president to have a veto overridden by Congress. Few presidents have had to contend with as much political turmoil. "I am abused, in Congress and out, as a man never was before," he wrote to a friend in 1842. And yet his accomplishments were not insignificant. Tyler ended the Seminole War and brought Florida into the union as the 27th state. He resolved a thorny dispute with Great Britain over the border between Maine and Canada. He signed the first treaty opening trade with China, and brought about the annexation of Texas. And he managed as well to have a deeply fulfilling (and fruitful) family life. Tyler raised eight children with his first wife, Letitia, and after she passed away in 1842  the first sitting First Lady to die  he wooed and won the 24-year-old Julia Gardiner, with whom he fathered seven more children, the youngest of whom was still alive when Truman was in the White House. One crucial lesson of John Tyler's term in office is that presidents are never to be underestimated. Even unpopular presidents  even maverick presidents rejected by their own party and cabinet  wield substantial political influence and have the power to shape the course of national events. Another lesson, especially salient this Presidents Day, is that running mates matter. Tyler may have been little more than a ticket-balancing afterthought in the "Tippecanoe and Tyler too" campaign of 1840. But nine times now, such afterthoughts have abruptly been elevated to the presidency. Thanks to Tyler's firm precedent, the transition of power to the vice president has always been taken for granted. The storms that followed are a reminder that it's the only thing about an accidental president that anyone should take for granted.